Gluten-free mortadella sandwich at Rafns'. We are pleased to announce that gluten-free menu items will be a regular feature at Rafns' from now on. 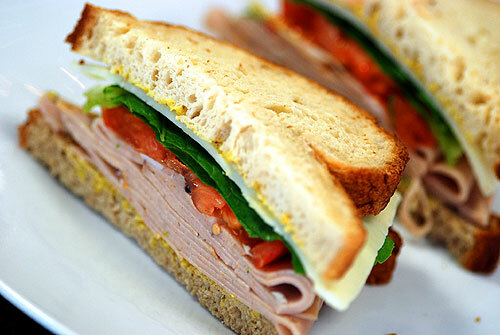 We always have locally-made gluten-free bread on hand for sandwiches, plus all of our salads can be made gluten-free. Many of our lunch snacks are gluten-free as well, including Betty Lou's fruit bars, Zoi fruit yogurt, and our oatmeal/fruit cups. Please visit our website often to see our most recent lunch menu. And be sure to tell your gluten-free friends that they have a new downtown lunch option!